Hopelessly Devoted Bibliophile: Meet Jennifer Brown! This lovely lady right here is Jennifer Brown! 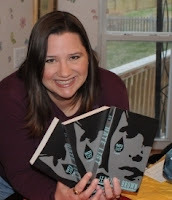 She's the author of many books, including Hate List and Bitter End. Today Jennifer is here to share with us a little bit about herself in an author interview! I tried to ask her some fun questions so you could all get to know the quirky parts about her! Oh, goodness, no. I wish I was a crafty person! I love crafts, but I have no patience. Which is funny, because I can work on a single paragraph for hours on end, but when it comes to gluing stuff together or making things with beads, I just can’t do it. As much as I’d like to. I’m afraid the craftiest I get is to put a ribbon through my bookmarks, but even then I lose patience about ten bookmarks in and enlist my kids to finish. 2) Next question, I know we all have one, so what is your guilty pleasure? Disney. All things Disney. I even just love to spend hours online, gazing at the Disney website, planning fabulous Disney vacations that we may or may not ever take, listening to Disney music. I even have a Disney tattoo. 3) What is one thing that you'd like to try that you haven't gotten around to yet? Food, activity or otherwise, it's all fair game! I’d love to learn to sing opera. It’ll never happen. I took art classes in school after my 7th grade choir instructor told me my posture was too bad for singing. But if I had guts and time and youth on my side again…oh, yeah. Opera all the way, baby. 4) Johnny Depp and Brad Pitt are standing in the same room. You only have time to go and get an autograph from one because they're both leaving! Which one do you choose? Johnny Depp, of course, especially if he’s in his Captain Jack Sparrow garb (see? Disney fuh-reak!)! 5) Finally, and thanks for playing along with my randomness, we'll end with a more serious question. What is it about writing that just keeps you coming back? Nature. I’ve been entertaining myself by telling stories since as far back as I can remember. I wrote my first short story when I was 8-years old, and even in times when my life was in crisis or unpredictable, I always wrote to make myself feel better. I couldn’t stop coming back if I tried. I would be losing a piece of myself if I did. See what we learn about authors when we just delve a little deeper? I'm smitten :). Thanks Jennifer for stopping by and all of you need to go check out her books! They are amazing! You can read my review for Hate List here, and I'll have my review for Bitter End up very soon!